Some dates are still available early December 2018 and January 2019, but it is filling up fast. Come to Tokomaru Bay on NZ's idyllic East Coast and enjoy a true beach getaway. Escape to the Cape is an amazing three bedroom rustic beach bach set in an absolute waterfront location. Watch the sunrise over the ocean from the master bedroom and enjoy the expansive views and huge indoor-outdoor living area. 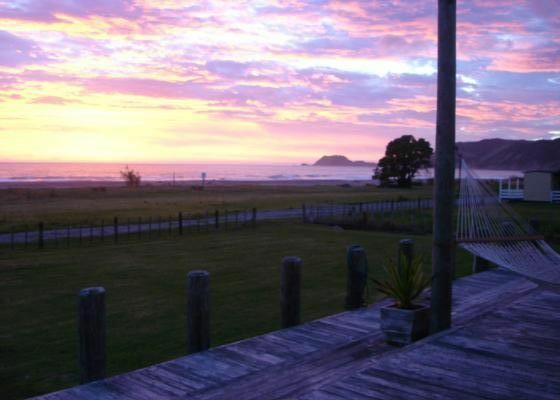 It has fantastic ocean views from all angles and is just metres from the golden sands of Tokomaru Bay. Swimming, Surfing, Kite-surfing, Kayaking, Fishing and Diving all at your doorstep. New Zealand's East Coast once again stealing the show. The house is made up of two double bedroom's and one bunkroom. The master bedroom has a large set of bi-fold doors that open out onto a huge three-layered deck. There are three Bi-fold doors in total along the front of this house that make for a seamless indoor-outdoor flow when open. It can sleep 7 comfortably with a sofa bed in the lounge allowing for an extra couple if requested. Linen is provided. Maximum of 9 people. Please ensure all parking is at the rear of the property. One night stays will incur a one night surcharge of $25.00. My wife along with two young boys travel to the East Coast regularly to experience the beautiful East Coast with family and friends. My wife is from the region and is proud to be from the Maori tribe from the area that is known as Ngati Porou. Stylish 3 bedroom Rustic Beach Bach with amazing decks and views out over the Pacific Ocean. Watch the sunrise from the comfort of your bedroom and throughout all of the main living areas. Stroll 70 metres to the waters edge from the front gate. Breath taking views and amazing location. Fishing, Surfing and Swimming and plenty more on offer at this wonderful piece of paradise. All parking is at the rear of the property. Te Puia springs course 20 min drive. Loved our stay here. Very close to the beach, lovely decorated, big rooms, amazing views, very good and quick communication. Will be back! Rustic, a little on the cool side. They advertised a washing machine, but none. Our son loved all the kids movies. Lovely clean and tidy house, very comfy, amazing views from the deck and the beach at your doorstep... what more could you ask for? Fully fenced property gave the kids and dog a chance to race around without us having to chase after them all the time - this made our stay nice and relaxed for everyone. Only thing that was rather annoying was the fact that the washing machine wasn't working - we have three little kids so that made for quite a bit of handwashing - but at least we did get advance warning about this from Chris. Amazing location and beautiful views! Right on the beach of Tokomaru Bay, this house is really where you want to be. It's just a quick drive or short walk to the local store, Tavern, beach, wharf - everything. There is so much light that comes into the house with the bi-fold doors, waking up to the view from the bedroom is amazing. We took some food and drinks down to the beach and watched the sunset, went inside and made dinner, then back out to stare at the sky filled with stars for a few hours. Big place with plenty of sleeping room for a big family or just two, like us. Would recommend bringing insect repellant as the sandflies loved us (but this isn't just this place, we found it to be the case for the most part of our travels from Tauranga all the way along the coastline until we hit Napier).